There's some interesting concepts -- and perfectly workable revised origins for some major villains -- in Francis Manapul and Brian Buccellato's Flash Vol. 2: Rogues Revolution. Unfortunately, for a couple of reasons this is a less impressive follow-up to their stellar New 52 debut; also, no matter what new ideas the authors bring, they're still treading on well-worn and hallowed ground, making it difficult for their stories to measure up. Manapul and Buccellato already demonstrated a talent for unusual storytelling in Flash Vol. 1: Move Forward, in which the reader learns an explosion early in the book is actually the time-displaced result of the characters' actions later on. In Rogues, the audience understands there's a conspiracy afoot only after they've seen the results of that conspiracy -- that the Flash's supposed friend Dr. Elias is actually working with the Rogues and is responsible for the bizarre changes that we've already seen the Rogues undergo. This is jarring for two reasons. First, I think many of us assumed that the Rogues' changes -- that Captain Cold, Heat Wave, and the rest no longer use weapons, but that their powers are now ingrained -- simply stemmed from New 52 fiat, and had therefore made up our minds about them. The changes didn't bother me as much as it might have some, but I did think Cold came off reckless and over-angry at the end of Move Forward; if I had known then, as I know now, that there was "more to the story," I might not have written off the character so quickly. The writers can't be faulted for making their story complex, but I wonder if the pre-revelation appearances of Cold and Heat Wave might've been too subtle for serialized storytelling. Second, the writers offer an Elias in this volume radically different than the one in the first volume. This is supposed to be part of Elias's motif -- he pretended to be friendly with the Flash purely for his own aims, and then he turned his back on the Flash when it suited him -- but the portrayals are so different as to seem incongruous. The Flash is understandably caught "flat-footed" by Elias's about-face, but again, I felt the writers veered too-subtle in terms of what the audience understood. I would further fault the authors for giving the Flash a villain too similar to Lex Luthor, if it weren't already so clear what Flash villain Elias will turn out to be (though how that will work with established New 52 continuity, I'm not sure). Once I understood the breadth of the story -- Flash versus the Rogues, the Rogues versus themselves, the Rogues versus Elias, Flash versus Elias -- I rather liked it. Certainly having an in-story explanation for the Rogues' new powers, and having it matter to the story, is better than it being just a throwaway change. However, the storytelling remains wonky in almost a Silver Age way -- the Pied Piper has suddenly returned to action off-camera, Barry Allen finds himself an entirely new identity off camera; maybe "Silver Age" is the right direction for this title, but in reading I felt continually off-balance. Added to this is the fact that Manapul only draws three of the book's six issues -- excluding, even, the extra-sized annual that wraps up the Rogue story -- and that makes it hard for the book to measure up to the tighter, Manapul-drawn first volume. Again, once I understood, I did enjoy the writers' new take on the Rogues. Cold can't get a drink without it freezing; Glider (nee Golden Glider) is only an astral projection from her paralyzed body; Mirror Master is trapped within his mirror world -- all of these changes add new pathos to the Flash's Rogues. At the same time, we must acknowledge that Geoff Johns used the Rogues extensively, and in great detail, in his Flash run, and this new team's portrayal doesn't hold a candle to what came before, especially where Cold is concerned. I liked the Grodd spotlight issue that starts off this book, drawn by Manapul, but even then I doubt that the Grodd battle promised in the next book can stack up to the same devastating sequence by Johns and Scott Kolins previously. Similarly, I appreciated how Barry Allen's secret identity played a role in the story. After secret identities essentially fell by the wayside pre-Flashpoint, it's a nice change of pace to see Barry having to consider how to account for his absences as the Flash and struggling with whether to reveal his identity to girlfriend Patty Spivot. The difficulty, of course, is the same as above -- as Barry hides out in the rougher parts of Central City and looks for work where he can lie low, I couldn't help but be reminded of Geoff Johns's Ignition. The fine details are not quite the same, but both are stories of Flashes "roughing it," and again, Johns's comes out on top while Rogues seems like a pale recreation. What Francis Manapul and Brian Buccellato offer in this volume is still good comics -- the real stumble in Flash Vol. 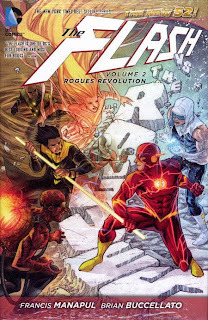 2: Rogues Revolution is not the storytelling, but really the uneven spate of guest artists that leaves Flash looking like every other comic book rather than a Manapul masterpiece. The majority of the next twelve issues seem to have Manapul on art, however, and with Grodd and then the Reverse Flash in the offing, I'll be along for the ride. One "off" volume hasn't shaken me from this series just yet. Coming up, a review of Superman Vol. 3: Fury at World's End. Don't miss it! I really liked Marcus To's fill-in work, and, frankly, I wouldn't have minded if he would have become the designated fill-in guy ala Tony Akins on Wonder Woman and Amy Reeder/Trevor McCarthy on Batwoman. Honestly, that's the kind of direction that I wish DC (and Marvel, and for that matter) would move in, especially considering the number of great artists out there who have trouble meeting monthly deadlines. As disjointed as it was in terms of art, it was nice seeing Scott Kollins add a bit to the Annual. It was a nice throw-back to the Geoff Johns Flash. I do agree with you that designated fill-ins (or relevant themed fill-ins of the type we used to see on Starman) would be good, though I'm not with you on To specifically on Flash. I have liked To's work on Red Robin and Huntress in the past, but for me here it was too "regular" as compared to Manapul's issues; in a different context I might've liked it, but here I didn't find it as complicated or ornate as Manapul's pages. Tony Akins works for me on Wonder Woman because his art looks similar to Cliff Chiang's; Trevor McCarthy doesn't really work for me on Batwoman because his art is so different from JH Williams's. Still, I guess I'd rather a consistent fill-in artist, even an incongruous one, than just whatever artist is available at the moment. Agreed on Kolins. I didn't have space for it in my review, but I too appreciated that Kolins got to draw the "old-style Rogues" sequence, which was Kolins's former bailiwick (if in a different continuity). In all I disliked how padded that Annual seemed to be, especially "Chapter 1," but Kolins's pages were a treat. I just read this, and I'm not sure if I just somehow missed this, but what ever happened to Iris West stuck in that other dimension with Turbine plot? Later in the book we see Turbine out free, and it almost seemed like it did a time skip with people saying Barry died and the Flash left, it just made me really confused on that part. I liked the rogues, but I kept thinking "Why isn't he desperate to find Iris anymore?"